On the surface, it might sound like one of those amateurish conclusions a blogger might reach after having just read the press release: Symantec, a software company now mainly known for security products, acquires some assets from a non-competitor in order to get that company’s logo. But in the deal between Symantec and VeriSign announced yesterday, there is no mistaking the fact that the antivirus products maker acquired, among other things, the single asset that just last week VeriSign argued was the ticket to its own future stability: quite literally, its own logo. Up until yesterday, its name was the VeriSign Trust Seal. A big part of VeriSign’s business had been the licensing of that logo to “trusted” Web sites whose security services pass VeriSign’s test. So when online shoppers see that pixelated checkmark inside the circle, they conclude the site they’re shopping on is safe…and they’ll buy more. A marketing brochure published by VeriSign in March (PDF available here) tells the story of how the licensing of the Trust Seal logo to the online mall TheFind, which represents a multitude of smaller retailers, discovered that for those retailers it serviced that did display the Trust Seal, click-throughs increased by 18.5% over rates for retailers without the seal (Symantec estimates the “sales uplift” for retailers bearing the logo as high as 36%). The business that got VeriSign as far as it’s come thus far has been the sale of SSL certificates to Web sites, and the subsequent licensing of its Trust Seal to those sites that meet VeriSign’s conditions. The brochure implied that the checkmark was an indicator of trustworthiness that goes over and above the little padlock symbol that browsers use to indicate the presence of SSL or TLS encryption. Late last month, VeriSign published its financial results for Q1 2010, and they’re not all bad. But they were a continued indication that the SSL certificates business was flagging, as executives credited themselves with bumping up the company’s Naming Services division — where it competes with the likes of GoDaddy and Register.com — and picking up the slack. VeriSign began its expansion of its Trust Seal Services business last February. Two weeks ago, during its quarterly conference call with analysts, CEO Mark McLaughlin made a bold pronouncement in a response to a Baird & Co. analyst (Seeking Alpha transcript available here): His company would begin marketing the Trust Seal to Web sites that don’t use SSL certificates, in a move that would risk diluting the meaning of the seal in exchange for addressing a much broader potential market. However, as analysts from the online financial service Trefis predicted following that announcement, that dilution strategy would not be as effective as VeriSign had hoped. The fact that the checkmark had come to stand for quality SSL certification, it concluded, would reduce its attractiveness for anyone else who thought it could stick the checkmark on its site at random, and call itself a VeriSign partner. 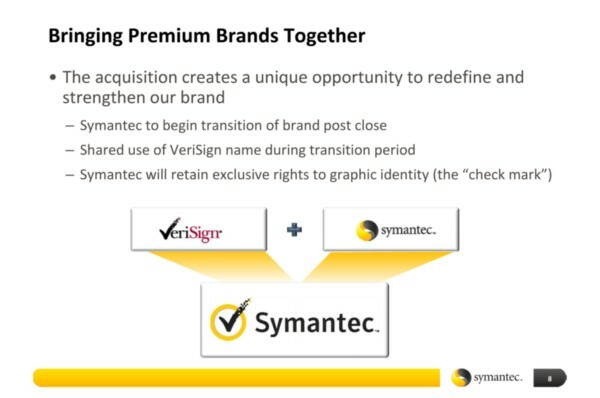 As Symantec made clear during its acquisition announcement yesterday, although it’s acquiring VeriSign’s SSL certification and Trust Services business, along with its logo, it’s not acquiring that company’s strategy. SSL certification could become an influential selling point for Symantec’s existing enterprise security products, such as Symantec Protection Suite. Rather than broaden the Trust Seal’s addressable market, Symantec now plans to tighten its focus, making it more of an incentive for online retailers to purchase not only SSL certificates but other Symantec products and services as well. So while a billion and a quarter in cash is a lot to pay for a logo, Symantec seized an opportunity to save an influential business from drowning itself in its own market strategy. In yesterday’s announcement, Symantec said it would try to keep VeriSign employees who were critical to the business, though it acknowledged that some would be let go. That might not be a bad idea either.